We stumbled across this restaurant after visiting a nearby art fair. Just across the street is a harbour full of millionaires’ yachts – we were worried that the food was going to be overpriced. It was late afternoon and so we’d missed the lunch crowd. 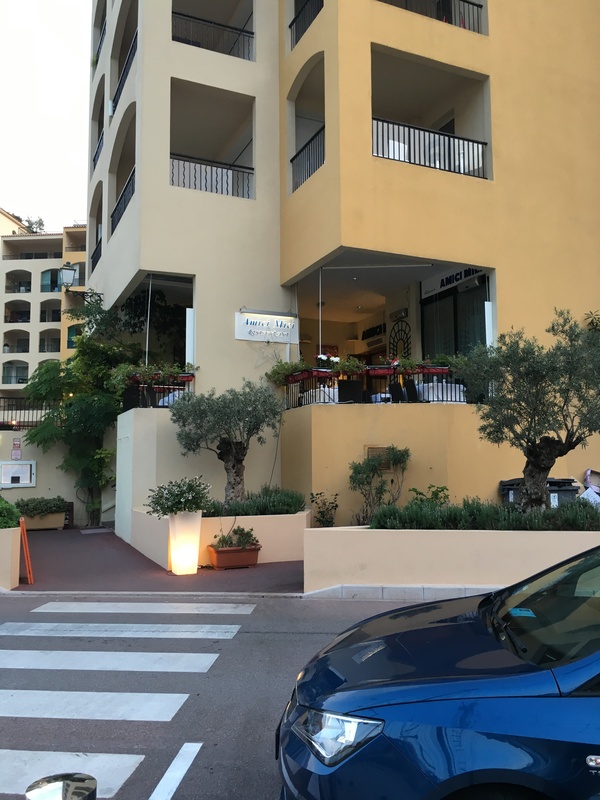 The place was empty but we were welcomed inside by the owner (Giorgio Colombesi) and we chose a nice table on the outside terrace. We didn’t want a full Italian meal and just talked to the owner about the pasta options. 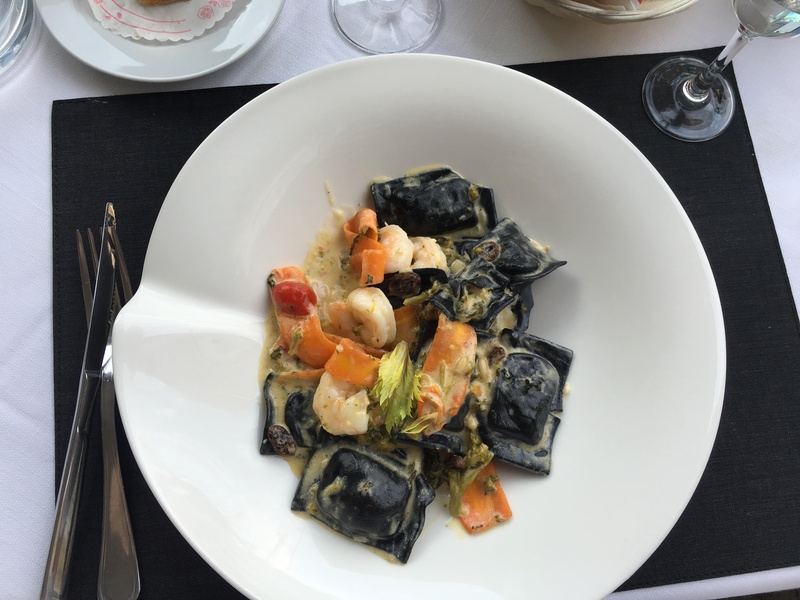 A squid-ink black ravioli, stuffed with sea bass (26 Euros), sounded delicious, as did the ravioli stuffed with mushrooms and truffles (28 Euros) – we ordered one of each. 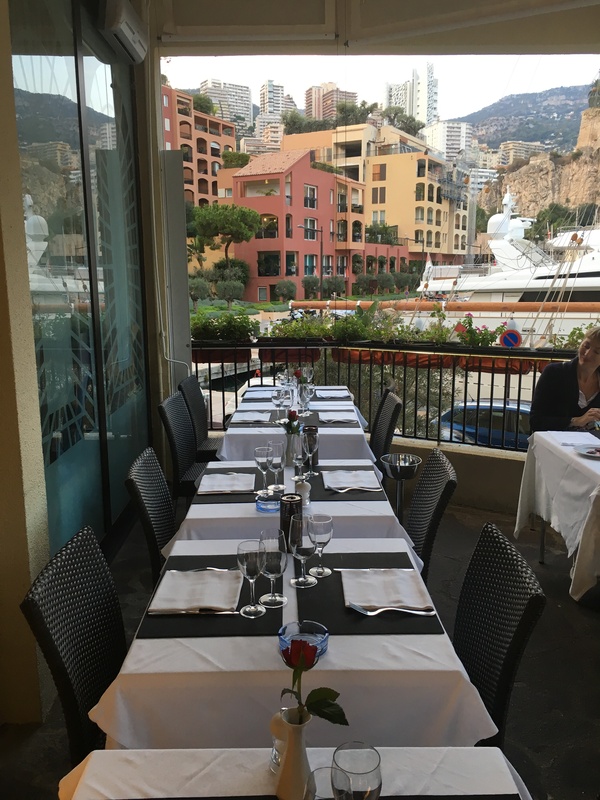 I’m guessing you’re thinking that was a little expensive for ravioli – but that’s pretty good for Monaco. A large bottle of water was 5 Euros. A small bottle of beer 7 Euros – I think the beer was probably a little expensive, even for Monaco! We were given some warm pizza-style bread, some regular bread and breadsticks – none of which were chargeable. Two large plates of ravioli arrived, beautifully presented. My seafood version also had a generous helping of prawns among the pasta pieces. Both dishes were absolutely delicious – certainly the best pasta we’ve had outside of Italy and on a par with some of the best in Italy. We were offered a limoncello on the house but chose Sambuca. The bill (Prix Nets)also came with some lovely chocolates. Prix Nets, is, I believe, what is written where service is included and that this is typical, if not law, for France and Monaco. We tipped an extra 10%, partly to be sure and also because we’d enjoyed everything. We enjoyed the food so much that we returned early evening the next day. I had exactly the same and my companion had a salt-baked Sea Bream/Dorada (42 Euros). This appeared as a full fish, flaming with grappa. The owner’s wife then skilfully filleted the fish, leaving two large delicious pieces presented with a side of vegetables. Another Sambuca later and we had to say goodbye to this restaurant as we were only in Monaco for two days. I’d definitely recommend a visit – although you’ll need to head down to Fontvielle, which is some way from the usual sights like the Casino de Paris, but isn’t far from where the helicopter lands. You could fly from Nice for 130 Euros and head over for dinner!